Skylar is a cat with chronic osteoarthritis localized to multiple joints. While Skylar continues to experience chronic pain related to his arthritis, he does have improved mobility and less vocalization post treatment. Skylar is a 15 yo MN DSH. He originally presented to our clinic for evaluation of seizures. It was determined at this visit that in addition to his morbid obesity, he had severe flea allergy dermatitis. His intense pruritus combined with his inability to groom himself due to obese body condition resulted in spastic, pruritic episodes when touched that the owner mistook for a seizure. Based on their severe financial limitations and inability to treat the cat appropriately, he was surrendered to the owner of the clinic 4 years ago. He has exhibited progressive musculoskeletal pain since being surrendered. He receives daily Dasuquin and gabapentin for pain management. He is indoors only. Skylar has a current body condition score of 6/9. Normal vital signs and cardiac and lung auscultation WNL. He has diffuse muscle wasting along epaxial musculature. He walks with a generalized stiff and stilted gait. He has reduced range of motion through both carpi and elbows, and pain on palpation of thoracolumbar spine and hips as well as bilaterally thickened stifles. He has difficulty jumping and must be lifted up and down off any tall surfaces. There were numerous trigger points in his dorsal neck musculature. Spinal reflexes were found to be intact. Last blood work revealed stage 1 renal disease. Based on the generalized pain and significant reduction in mobility, Skylar has been treated on an ongoing bi-weekly basis with some sessions skipped due to scheduling and travel. The goals of treatment were to reduce nociceptive input into the spinal cord, encourage release of endogenous opioids, induce muscle relaxation of painful trigger points, and improve overall comfort and mobility. I selected points based on trigger point location, joint pain, and general points for relaxation as well as anti-inflammatory action. Since Skylar is in stage 1 CKD, I also selected kidney points for his treatments. Skylar has normal spinal reflexes and normal proprioception. Based on this a myelopathy seems less likely, and even though all 4 limbs are affected, osteoarthritis is more likely based on presentation and clinical signs. No advanced imaging was pursued in this case, so I cannot definitively rule out intervertebral disc disease as a source of pain without neurologic deficits. 7 treatments in total thus far. Q 2-3 weeks some some exceptions made due to scheduling conflicts and travel. Not all of these points were included at each treatment, but all of the following points have been treated over the course of the 7 treatments. Each session was based on patient myofascial exam and tolerance of needle placement. GV 14 and GV 20 are the first two points I have placed at each treatment to assess Skylar’s mood and anticipated tolerance of treatment. GV- 14 was also selected for neck, back and thoracic limb pain, while the goal of treating GV-20 was to reduce anxiety and induce relaxation. LU 5 and LI 11 were selected for elbow pain. Generally, Skylar was more tolerant of dry needling at LI 11, so this point has been selected most frequently. BL-10 along with local trigger points in the neck have been treated when indicated based on myofascial exam. LI-15 and TH-14 were selected for shoulder pain. For the both the lumbar and pelvic pain as well kidney disease, I have treated BL-23, GB-25, BL-52 and GV-4. Additionally, Bai Hui and BL-25 were selected for pelvic and pelvic limb pain. ST-36 was selected for a distal limb point, anti-inflammatory action, as well as stifle pain. GB-29 and 30 were also selected for hindlimb and hip pain. Skylar was very tolerant for needle placement, but he did not tolerate needle placement distal to the elbows or the stifles. At several treatments electroacupuncture was performed along the inner bladder line points or across the hip points. Following the introduction of acupuncture, I would love to be able to say Skylar is living a pain free life, but he still has some degree of chronic pain on a daily basis. It has been noted since starting acupuncture that he does seem to vocalize less frequently, and he has been more social. I cannot honestly say I have appreciated a major change in his gait, but on subsequent myofascial exam following therapy he does have fewer painful trigger points. He is due for his recheck labwork soon, so I will be interested to see if his renal values have remained static or if they have improved. He has not started on any new medications since beginning acupuncture, so I have no reason to believe the subtle improvements we have noted are related to any other treatment or therapy. He has continued on the gabapentin and Dasuqin, but these were in place before acupuncture began. 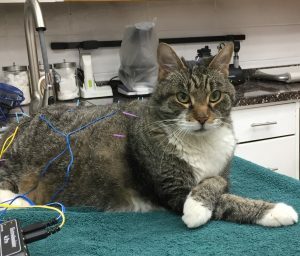 This case has taught me that cats can be tolerant of acupuncture! 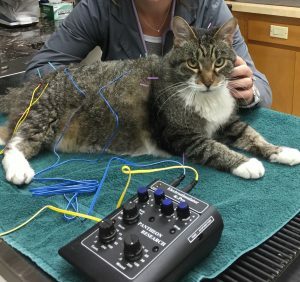 I think the patient selection is still an important part of the process, but I have gained a great degree of confidence in my ability to successfully treat a feline patient with acupuncture. As I seem to have a large population of aging and geriatric kitties in my practice with various chronic conditions, I am looking forward to incorporating this modality more on appropriate cases. CuraCore course materials and associated reading material.